Hello beautiful Pretty Providence readers! Colleen here- mama of twins and lifestyle blogger over at Lemon Thistle (home to DIY, Parties, Printables, Home Decor, & of course babies!). 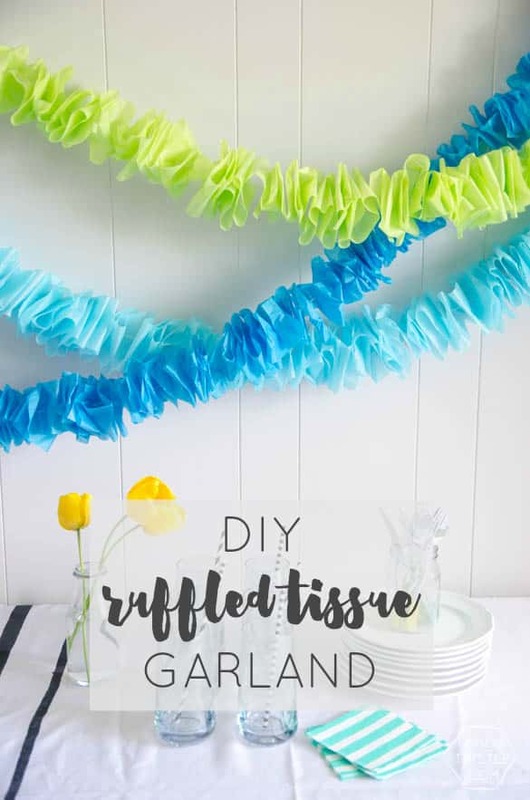 I’m happy to be back with you and sharing this frugal but festive DIY Ruffled Tissue Garland. 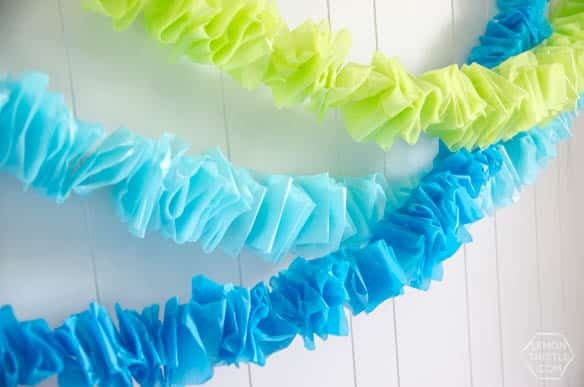 If you had nothing in your stash but scissors, this garland would cost you $3, one for the string, one for the needle and one for the tissue. If you wanted to have more than one color- add a dollar for another pack of tissue. Awesome, right? Can we talk about garlands for a minute? I’m such a fan. And not just a fan for parties, but to bring a bit of joy into our homes on a daily basis. I posted a copper bunting a couple weeks back and linked to all the garlands I’ve shared and noted where they are now… and I didn’t realize how many I had! 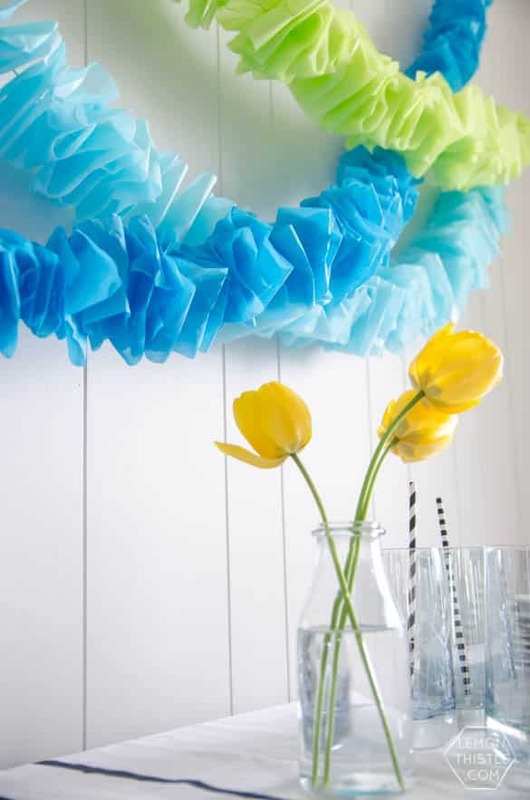 I have at least one garland in almost every room in my house. And I love it that way! I don’t think that we should save them for a special occasion all the time, put one in your kids room, put one in your hallway- wherever you want to bring a bit of fun. But back to this garland. 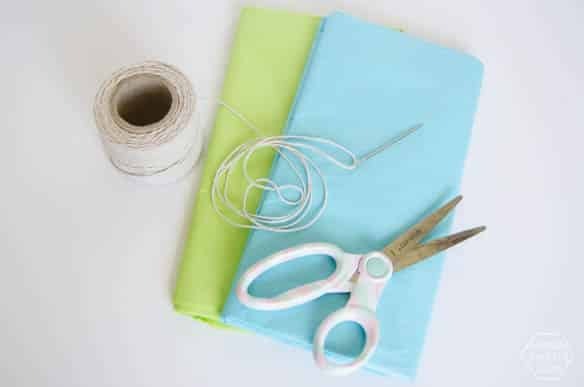 Start by cutting a three or four inch strip off your tissue paper. The wider the strip, the thicker your garland will be. 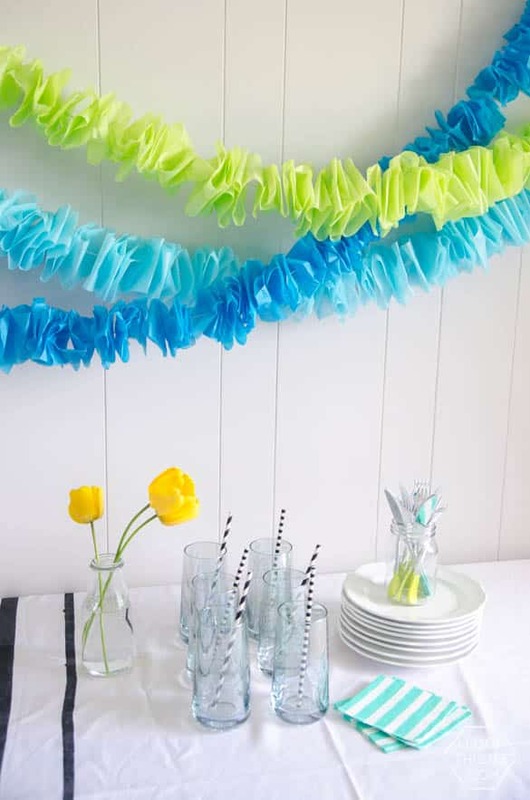 I used one strip from each pack of tissue paper to make the garlands. If you wanted them longer, you would need to cut more. 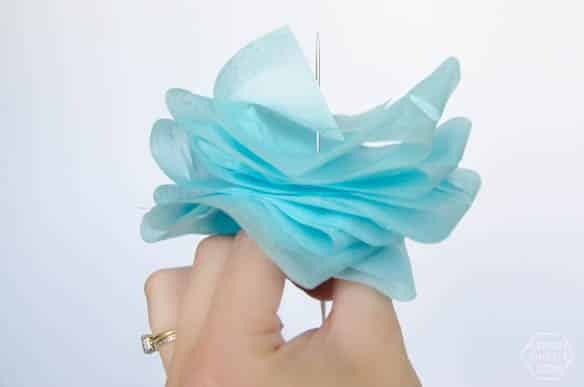 Take one piece of the tissue at a time and fold it onto the needle as shown for a ruffled effect. Keep adding pieces until you are out of tissue. Then, spread out the ruffles and fluff them up. That’s it! These three garlands took me about 30 minutes, so turn on Netflix and watch your favourite show (but pay attention not to poke yourself with the needle!). I love that it’s so versatile, it could be used with almost any color scheme… as long as you can find the tissue! So cute! I’m throwing a bridal shower in June for my little sister and this will be hung all around. 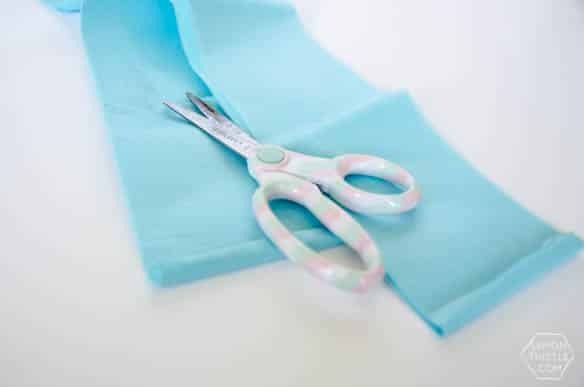 What are your thoughts on using streamers instead of tissue paper? That’s what I thought it was at first.